When the family moved to Noccundra Molly was born in the Noccundra Hotel, then Bill, Harry, Alf, Mavis and Ned were all born at Noccundra in the cottage near the hotel. 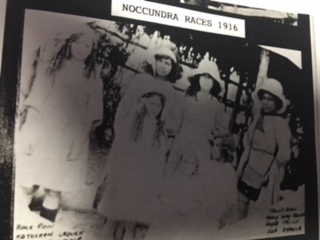 Race meetings where held often and there were about six families permanently living in Noccounda. 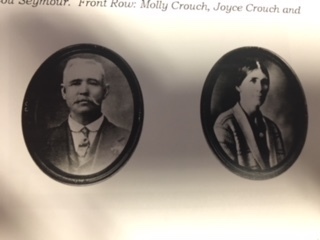 Some of the families were Bachelor’s, Richie’s, Marshall’s, Uncle Paddy who was my mother’s adopted brother and Paddy was married to Annie McCarthy. Phylis Keane was one of my mates in Noccundra and I did school by correspondence and my sisters taught me. My friend, Linda Bachelor, moved from Noccundra to Hungerford and we use to write to one another. Linda and I were great mates and not long after Linda moved she started to tell me about her new friend in Hungerford Margaret Clayton. Dad used to play the accordion, the mouthorgan and other instruments in at dances and things around the district and at Thargomindah. I first Met Margaret Clayton when I was about 14, 1926 and Margaret would have been about 18. I think it was at a dance in Thargomindah. 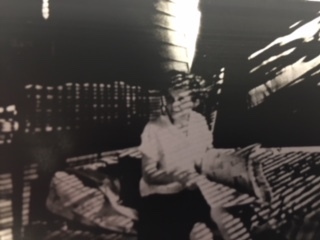 Margaret and her family were living on a property that Margaret drew in a ballot called Dilltopper Thargomindah. 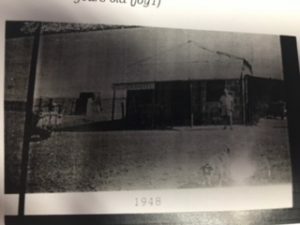 Margaret would ride to town with her brothers, Bill and George Clayton and they would stay at the Thargomindah Hotel overnight, go to all the dances and then ride back to Dilltopper the next day. 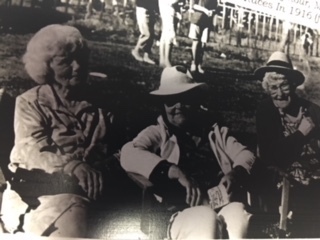 Amie Urvine was Margaret’s first friend in Thargomindah. I remember when I first met Margaret she was a real lady. She was a Cockey’s daughter you know. 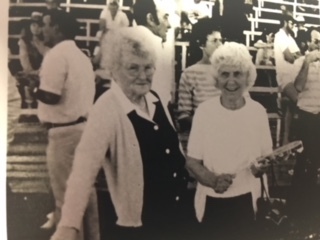 Margaret and her mother were always very close and always near one and other. Mrs. Clayton never learned to dance or ride, but she always saw to it that Margaret learnt to do both. I remember when my Grandmother died and I ran into Margaret down the street. Margaret asked if I was going to the race ball that was on that night. I told her we weren’t able to and she said, “Joyce you should come on down, it won’t do you any good staying at home. There were always plenty of boyfriends for us all and Margaret’s boyfriend was Billy Manning a drover. Well Billy went away on a really long droving trip and Steven (Bub) Emery cut him out while Bill was away. Bub loved going to dances and was a good dancer. Margaret really enjoyed herself when she got the job in at the Hotel because it was the first chance she really got to be around girls. A girl gets really tired of living out in the bush with just men about, you know. I remember when Margaret won Queen of the West in Thargomindah when she was about 23 or 24. When she won everyone was saying all day that they wanted to have the first dance with her. There was a fella by the name of Snowey McLean who worked in the Club Hotel Thargomindah and he was the one that got the first dance, but everyone wanted it. I don’t know what prize Margaret won but they get a lot of money and big prizes for winning things like that these days. A friend of mine won one of those competitions back then and the prize she got was a bible, not like what they get now. Margaret married Steven (Bub) Emery in the Thargomindah Hall. It was a really big wedding and all my family was invited and went. Guess where they went for their honeymoon? To the Eulo Queen Hotel in Eulo. Bub and Margaret were a really good pair, they were always the same the both of them. There was a bloke that used to come to Del’s window and frighten her. We called the police and Bub came over to see what was going on as my husband Roy was a fencer and often away working. Bub was so sick then with Leukaemia, but he still got out of bed and came over. The police asked Del did she see the bloke and she said yes she did, because he had no clothes on. Well Bub was so disgusted, I reckon if he had found the bloke he would have sorted him out, even as sick as he was. The day Bub got caught sly betting on the racehorses my husband, Roy, had just had a lucky escape from the punting before the police arrived. It was so funny poor old Bub was so embarrassed on the back of the police car going to jail. He pulled his hat off and put it over his face so that no one would know who he was. We all knew though! My husband, Roy, once worked in the Post Office at Bathurst and one day he wanted to go to a race meeting and they wouldn’t give him the day off so he just walked out. It was after that he found out about real hard work outside. I met Roy Cowie the week after I moved from Noccundra to Cunnamulla in 1936 or so. I met Roy because he was working with Wally Davies and Wally boarded with my family. Roy then went away working with Mr Winters sinking bores. We finally got married and Patty Cowie was my first born in Cunnamulla at the Cunnamulla Hospital. Then seven years later I had twins Del & Edward (Buzz) Cowie. When Del was a baby Margaret sent Chris over to give her bottle to Del to try to wean her off it, but Chris was so upset later that night that Margaret had to come over and ask for it back. The kids at school named Edward, Buzzy and that’s what we’ve called him ever since. Roy spent a lot of time working on properties, yard building and all sorts of things. When I was at home with my twins, Margaret and Kallie became very good friends and they use to go everywhere together. They really were good friends. They would go to the football and the movies. When Buzzy was in his second year of Uni he talked us into moving to Brisbane. Roy worked in a hotel kitchen and then at the Oasis where he was a jack of all trades. They use to have pools, gardens and functions there. I worked at the old person’s home in Annerly just down the road for seven years. I have three children, nine grandchildren and five great grandchildren at the moment with one more on the way soon. For more information about families in the Outback and Cunnamulla like Thomas Pain click here! In Uncategorized Tagged Alf Crouch, Amie Urvine, Annie McCarthie, Barney Crouch, Bill Clayton, Bill Crouch, Bill Manning, Bsachelor's, Bub Emery, Buzz Cowie, Club Boutique Hotel, Club Hotel Thargomindah, Cooper Creek to Cunnamulla Bike Ride 2018, Cunnamulla 150, cunnamulla accommodation, cunnamulla history, Del Cowie, Dilltopper Thargomindah, Drover, Eulo, Eulo Queen Hotel, Flo Carwadine, George Clayton, Googie Teelow, Harry Crouch, Hungerford, Hungerford History, Joyce Cowie, Joyce Margaret Crouch, Kelly Crouch, Kelly Teelow, Lena Crouch, Loinda Bachelor, Margaret Clayton, Margaret Emery, Marshall's, Mavis Crouch, Molly Crouch, Mrs Catherine Clayton, Ned Crouch, Noccundra, Noccundra Cottage, Noccundra History, Noccundra Hotel, Noccundra Races 1916, Paddy, Pat Cowie, Phylis Keane, Queen of the West, Rene Manning, Richie's, Roy Cowie, sly betting, Steven Emery, Teelow, Thargomindah, Thargomindah History, Thargomindah Hotel, William Crouch Bookmark the permalink.